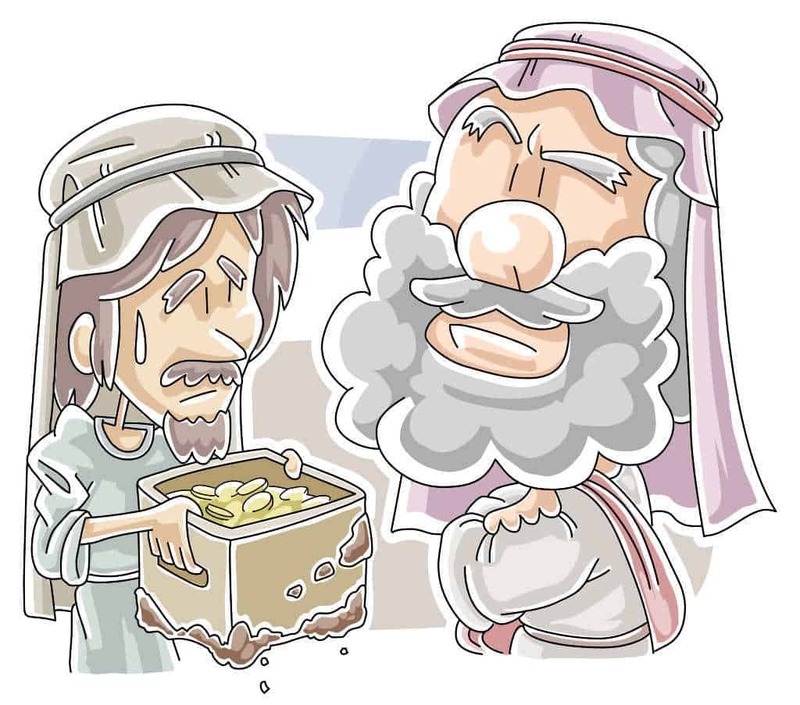 This free Bible lesson is based on Matthew 25:14-30 where Jesus tells ‘The Parable of the Talents”. It is designed for children’s church or Sunday School. Please modify as best fits your ministry. If your church follows the Revised Common Lectionary, this teaching plan would correspond to Year A – 23rd Sunday After Pentecost, Gospel Reading – Matthew 25:14-30. Give the class a few minutes to prepare a talent to share. Singing, drawing, touching their tongue to their nose…ANYTHING. Then put on a mini talent show so everyone can share (including yourself!). After the mini talent show is complete, award 1st, 2nd, and 3rd place. These three will play a roll in the following lesson. *Prior to class, do a little math to help illustrate this lesson in terms and amount your kids can relate to. Well, it seems this class is quite talented. And I bet there are MANY more talents in here that we couldn’t see. Maybe you’re good at fishing, or playing piano, or reading, or even giving hugs. Jesus talked about talents once when He teaching the disciples; but in this case, the word talent had more than one meaning. Back when Jesus was on earth, a talent was also what they called a very large amount of money. I mean VERY large! Jesus told a parable about a master and three of his servants. The master had to go away on a long journey, so he brought in his servants and gave each of them some money to be in charge of. This way they could continue to run the business and make money while he was gone. So the master asked one of his most talented servants (3rd place winner) to come forward, and he gave that servant 1 talent (1 coin). Now this might not seem like a lot, but just wait. That 1 talent was worth 20 whole years of work for him! That’s like $301,600 OR (1 talent) . Then he called up a servant with even more talent (2nd place winner) and gave him 2 talents (2 coins). That was 40 whole years worth of pay! $603,000 OR (2 talents) . Now it’s time for the MOST talented servant (1st place winner). The most talented servant was given 5 talents (5 coins). That is a full 100 years worth of work! 100! That’s like $1,508,000 OR (5 talents) . This was something new for these servants, to be trusted to take care of something so huge! They didn’t go to school, they didn’t have fancy homes or a huge farm. These were just basic servants, but the master knew they could be more and he trusted them with his talents. So what do we think they did with these talents? This servant just got invited to celebrate with his master. A servant would normally be serving his master, not celebrating with him. That was huge! It looks like you were able to use those talents and you also doubled them. You now have 4 talents! (give 2 extra coins) That’s like $1,206,400 OR . And what do you the master said? The same thing! He was just as happy with this servant as he was with the first. The first servant had more talents in the end, but what really mattered to the master was that the talents he gave them were used wisely. So now there were 2 servants celebrating with the master. Now let’s see how our 3rd place winner does. How many talents do you have? Just 1. I bet you can come up with a way to make some money with that talent, but the servant in the story couldn’t. He was so scared he might do something wrong that he decided to do nothing at all. He took his talent and buried it so no one could find it. When the master came back he asked the last servant what he had done with the talents. But when the servant told him he chose to hide his talent out of fear the master became very upset. The master gave him that talent for a reason, but the servant chose not to use it. So instead of celebrating with the master and the other servant, he was sent away. It’s pretty neat how Jesus used talents in this parable. Because the master gave the servants talents in the form of money, but God gives us talents in the form of abilities; just like our talents in the talent show. He made some people to be amazing singers, so they could worship and lead others in that same worship. And He made some people good listeners so they could listen to the needs and struggles of others and help them. And He made some people strong and handy, so they could lend a helping hand to those that needed it, just like Jesus did. God gave all of us talents, but they aren’t all the same. Each one of us has different talents and different ways to use them. And even though they are different, they aren’t better or worse than each other. God just wants to see us use them instead of hiding them. That’s why He gave them to us! He wants us to use those talents to bring more people to him and to grow His kingdom. I want you to try to find a way to use one of your talents this week to grow God’s kingdom. It can be as simple as reading someone else a story or helping them pick up something they dropped. It doesn’t have to be big, it just has to be for God. Hand out supplies and invite kids to draw a comic strip showing how they can use their talents to grow God’s kingdom (similar to a super hero comic book). Before the end of class ask for volunteers to share theirs with the class. Ask for a volunteer to pray for the class before leaving, and encourage them to thank God for the talents He has given them, and ask God to help them find ways to use those talents for Him. Tony Kummer (Editor) reviewed & updated this page on : June 6, 2015 at 11:58 am. All our content is peer reviewed by our readers, simply leave a comment on any post suggest an update.